Hope you all had a great weekend! Happy Monday to you! O yum! 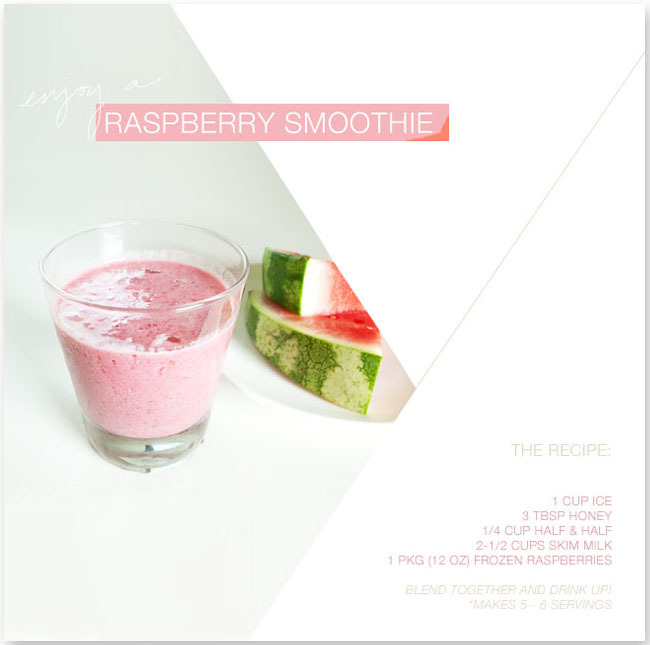 Thanks for the recipe, raspberry's are so good for you. oh yummm... i cannot wait to try this out! Mnnn! It looks soooo yummy, Danie! I'm so trying it now...I have the honey, the milk and the raspberries...wait! ...what's half & half...heeelp!!! Mmm, this sounds delicious! I've been all about raspberries lately. Janell: Hope you like it! My dad actually thought it was way too tangy (which I love), but just add extra honey if you like it sweet. Ines: Ah, almost there! So sorry! I should have said what half and half is. It's half cream and half milk. You could even just substitute it with a few tablespoons of heavy whipping cream if you'd like. Hope that helps, dear! Sounds delightful and super healthy. I will try it! Great idea! I'll try it. Thanks for sharing. Aaaaahhhhh!, thank you Danie!, yesterday I made it with a huge tablespoon of vanilla ice cream, and it worked really nicely...in a "milkshakish" way ;)...haha! Cathy: Yay! Hope you like it! Michela: You're so welcome! It's always so refreshing to me. Rhianna: Thank you so much! Oooh, my gosh. I'm so sorry to hear that. I would be such big baby if that happened to me. :( I hope it gets better soon! Hope the smoothies help a bit. I'm so glad you're here! Ines: Sweetie, I'm so glad it worked! Vanilla ice cream pretty much makes anything better! ;) Abrazos and besos back to you, love! Oooh how delicious it looks! THANKS for the recipe and inspiration!! Oooh tasty !!! Love smoothies !